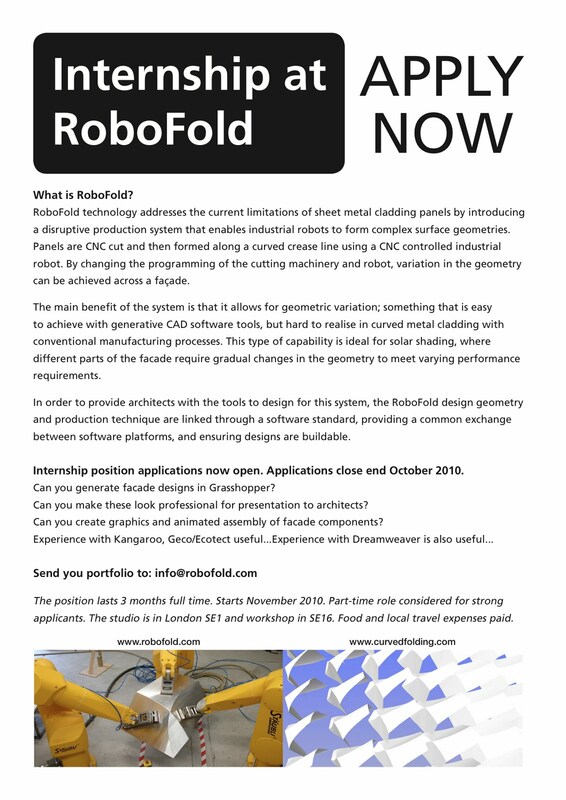 RoboFold is offering an internship and applications are now open. Applications close at the end of October 2010. Can you generate facade designs in Grasshopper? Can you make these look professional for presentation to architects? Can you create graphics and animated assembly of facade components? The position lasts 3 months full time. Starts November 2010. Part-time role considered for strong applicants. The studio is in London SE1 and workshop is in SE16. Food and local travel expenses paid. Send your portfolio to info@robofold.com. See http://www.robofold.com/ for more info on the RoboFold process.